I know, I know, I said I wouldn't post until after the new year ~ I just can't help myself from putting this page idea up. It has been running around my mind, so I thought I would clear it out to make room for other stuff ~ like where in the world I placed those New Years Eve hats! I hope you all had a wonderful Christmas! I know I thought of you all throughout the holiday. I downloaded my pictures Christmas evening and found some that were soooo precious they brought tears to my eyes. Some brought tears of pure joy, some brought tears of laughter, some brought tears of pride, and, some brought tears of Christmas' past. I have a couple that, for various reasons, will forever be my absolute favorites from the day. How about you? Do you have a picture that truly says 1000 words? Do you have one that will be a treasure because it is of one you completely cherish? So, here is my thought.....now, while the feelings are fresh, and the moment is so alive in your mind, do some quick journaling. Sit down at the computer and type out what you would like to journal about that picture, save it, then when you are ready to do a page, all you have to do is copy the words on your page, or change the font and formatting, and, there, you have those words preserved. Or, grab some notecards and write what you would like to remember / say about the day or particular pictures. Or, if you want to be really ahead, cut some photo safe lined paper in squares and journal, then you can place the cards directly on the page. I know I have a couple of pictures that may have earned themselves the "gotta enlarge and have their own page" reward. How about you? Write those words down tonight. OK, I will try really hard not to post until after the New Year. Have a blessed and safe New Year and be ready for great things in 2006! Scrapbookers Bubble Bath will be on a mini-sorta-vacation until January 3rd. We have lots planned for then, especially the introduction of our newest product addition, DUCKS. Of course, the site will be up and running, the books are available for purchase as downloads, and, I will mail out purchases as well. However, I will save new posts and products for after the New Year. Read the new post on Held By Him about the story of the Christmas Lights, enjoy your family, and, most importantly, seek Him and His Presence this season - He is the best gift you can give yourself and your family! Mommy, where is Frosty's cookies? As I hung the ornaments on our Christmas tree this year, my 5 year old asked me lots of questions about every single one of them. “Was this when you were a little girl?”, “Did you and Daddy get this for your marriage?”, “How come Santa’s feet are missing?”, “Mommy, where is Frosty’s cookies?”. And, as I hung up the treasured quilt from my mom and set out the Nativity my son made when he was 4, such wonderful memories poured in. I found myself thinking of precious moments, loved ones who are no longer with me, and how much the Lord has blessed me beyond what I could ever deserve. You know, I took pictures of all of those ornaments 3 years ago with wonderful intentions of making a Christmas book with the stories and pictures of each ornament—but, like so many other things, I just could not get to it. BUT, after this past year and it’s moments, and hearing my daughter’s desire to ‘hear the story’ I realize that book is a priority. 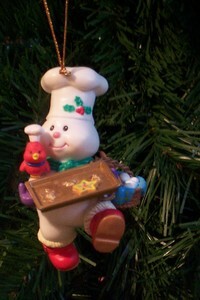 And, it must be more than just the ornaments ~ there are so many decorations that have a story just waiting to be told. So, that is my challenge to you and desire for you ~ to record your Christmas Decorations Legacy. I have included below some ideas, journaling questions and suggestions to help get you started. I know I have started working on mine. Our decorations help us celebrate the birth of our Savior ~ leave your legacy through the story of these treasured possessions you have gathered over the years! · Choose a special album that will be designated for your decorations. You then can add new entries through the years. · While your decorations are out, walk through your home and take pictures. Write some brief notes to yourself as you look at the treasure. OR, you also can cut some journaling boxes from lined paper, then when the pictures are developed, you only have to add a few embellishments and, ta-dah, your page is done! · Record who gave you the decoration, why is it special, or any treasured memories or emotions that may come as you look at the decoration. · Do you have a special place for the decoration? · Let your children help make the pages for their ornaments. They can write what the ornament means to them and why they like it while you record your own words. · Don’t forget the nativity scenes, the stockings, and the Christmas music! · Remember, your loved ones want to know the story of your journey, and that includes your Christmas decorations!